The White Rock Crystal boots offer the ultimate in winter protection with a top-to-toe breathable waterproof membrane. 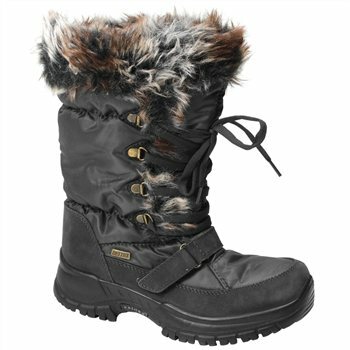 Starting from the ground up with a high grip sole unit ergonomically engineered around a woman's foot shape, the White Rock Crystal waterproof snow boots give you unbeatable protection from wind, rain and snow. Ideal for taking to the ski slopes, these Crystal boots are just as good at keeping your feet warm when out walking the dog in our unpredictable winter weather. Stylish and designer boots from this leading independent ski wear manufacturer, White Rock are set to storm the market with a warm, durable and practical winter snow boot. I first bought the black pair and was surprised at how light and comfortable they were and they also kept my feet lovely and warm without overheating, so I bought another pair in the brown, I walk the dog every day through muddy fields and these boots have a great grip, I haven’t slipped once. I’m really really pleased with them and would recommend them to anyone. These boots are so comfortable and warm. I don't know if they are waterproof yet, but I have worn them on several forest walks and it has been like wearing cozy slippers. They were delivered really promptly. Bought without going anywhere to try them on - and they are great! Shame the snow has gone - as I cant try them out porperly now till next year! Received the product within a couple of days. impressed with the quality of this product - very lightweight.